Staff writer Victoria Bowlin got a chance to talk with the Hinson Family! 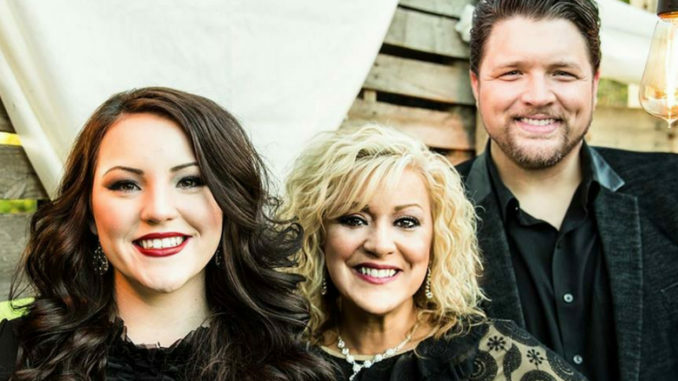 Get to know this family that comes from one of Gospel music’s finest families! Victoria Bowlin: The Hinson name has been around for many years in Southern Gospel music. Tell us how that got started. Weston Hinson: The family got their start in, as the song Uncle Ronny penned says, a little store front church in Freedom, CA, which is about 30 minutes northwest of Salinas, CA off historic Highway 1. It was December 12, 1967 when siblings Ronny, 21, Yvonne, 17, Kenny, 14, and Larry, 11, started singing at revivals and Camp-Meetings and their energetic style and unique delivery of song caught fire and began to spread. In 1970, Ronny would write a song that would not only change the Hinsons, but the entire landscape of Southern Gospel Music. That song was, The Lighthouse. Then, building on that momentum, the family would become featured on the wildly popular and nationally syndicated TV show called The Gospel Singing Jubilee from 1973 – 1980. That would make them a household name all over America! VB: What does it look like now? WH: Today, The Hinson Family consists of myself Weston Hinson, lead vocals and son of the late Kenny Hinson. Christy Hinson, soprano vocals, songwriter, and wife of Weston. And last but not least, Jordy, alto vocals. Jordy is Christy and my daughter. VB: Where are you guys from? WH: We are based in Hendersonville, Tenneessee, just north of Nashville. VB: Do you have a new project? WH: Yes, our latest recording is called, The Light Just Came On. It has been our favorite project to date!! VB: What are some of your favorites from the new CD? WH: “The Light Just Came On” written by Gerald Crabb, “Say The Word” written by Christy Hinson, and “Road To Damascus” written by Christy Hinson. VB: What seems to be the crowd favorites? WH: “Say The Word,” “The Light Just Came On,” “It Happened That Day,” and “Another Day.” They all seem to be very well received, but those are generally the ones that the crowd reacts the biggest to. VB: We’ve seen on social media that Christy has been dealing with some health issues over the past couple years. How is she doing? WH: Yes, over the last years, Christy has battled through Thyroid Cancer and the subsequent complications, but she is doing very well now thanks to God and his guidance with medical treatments. We are always on alert and proactive in an aggressive monitoring her health. We have felt all the love and prayers from all our fans and friends on social media and across all the cities we have been. Thank you to all of you!! VB: What do you feel God has been teaching you lately? WH: Without a doubt, it is a lesson of patience and trust. Not just in Him, but also learning who to trust in relationships with people. VB: Who has been your biggest influence in Southern Gospel music? WH: I would say that we have influences from a great many artists and songwriters in our peers. The Martins, The Isaacs, and The Crabb Family come to mind as some of the most prevalent. However, there are artists outside of our industry that also influence our style…like James Taylor, Michael Bublé, Tori Kelley, CeCe Winans, Donnie McClurkin, George Jones, I could literally go on all day, but when you love music it’s hard to not be influenced by excellence in that craft, and there is just so much great music out there. WH: Our website is www.thehinsonfamily.com and we are also on Facebook, Instagram, and Twitter. Victoria is a powerful singer, songwriter, author, and Faith-Inspired speaker who gives encouragement and hope through music and personal testimonies. Originally from West Columbia, SC, Victoria's background includes extensive singing and traveling full time with her family, The Shireys and participating in tent revivals held by her late Grandmother, Evangelist Mamie L. Clark. Through deliverance from a serious depression and multiple healings, God is using her testimony to reach countless people. chatbot companies: chatbot companies Learn top quality internet bot development today lifetime support today only!